The Google Daydream headset has received a lot of attention ahead of its release. It looks very similar to the Samsung Gear VR and seems to use similar technology. But Google Daydream has another component that makes a bigger difference compared to the Gear VR: its controller. 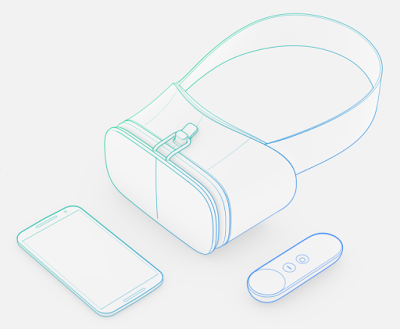 The Daydream controller looks like the Oculus Remote. However, the Daydream controller is much more sophisticated. 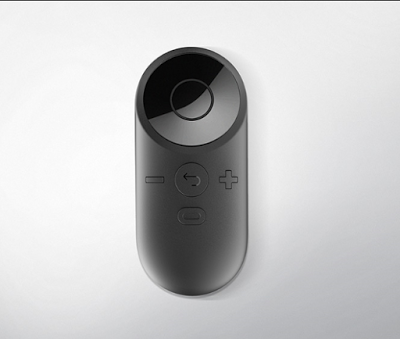 The Oculus Remote has a touchpad similar to that of the Gear VR. It also includes a couple of buttons. Likewise, the Daydream controller also has a clickable touchpad and a couple of buttons. However the Daydream controller also has a motion sensor, which the Oculus Remote lacks. The Daydream controller’s motion sensor has a magnetometer (for orientation), a gyroscope (to record pitch, yaw, and roll), and an accelerometer to measure the speed of movement on the x, y and z axes. It cannot measure its absolute location in space the way the Vive controllers can, but it is expected to have similar motion sensing capabilities as a modern smartphone. This will allow it to be used similar to the motion controller of a Nintendo Wii. For example, instead of pressing a gamepad button to cast a spell, the user can waive the controller like a wand. Here is a sample of Daydream apps in development, demonstrating the controller. Motion controls will enhance the user’s immersion compared to a gamepad. For example, on Samsung Gear VR, one of my favorite games is Archer E. Bowman, a bow and arrow wave shooter (shoot down waves of enemies). You aim with your gaze and press the touchpad or press a button on the gamepad to fire. On the HTC Vive, there are several bow and arrow wave shooters as well. My current favorite is QuiVR. In QuiVR and other similar games on the Vive, you use the Vive controllers as a bow and arrow, using a similar motion as you would with a real bow and arrow. While it is definitely harder to hit enemies, it is much more satisfying and immersive to use the motion controllers. Motion controls therefore make a huge difference and bring the user one step closer to immersion in the virtual world. We do not know yet if the Samsung Gear VR will also add a motion controller of its own. It’s technically possible, although none have been announced.